We all try to be well-meaning with our pantries as it’s a means of survival and makes economic sense, but it always ends up with a clutter of foods. Food so you don’t need to make trips to the shops all the time. Food that you buy during a sale on the premise that you will use it but it ends up hidden in the back of your cupboard and you forget about it. Food that you bought to cook one dish and never needed for anything else. Food that is handy to have around for quickly whipping up a meal at anytime. The usual suspects are dried pasta, rice, lentils, nuts, spices, a range of condiments and various canned goods like chickpeas, tomatoes and tuna. No matter how much I eat, the amount of food in my pantry is always increasing rather than decreasing. I think this is due to the fact that I like trying to cook new things and experimenting so I accumulate a lot of food items overtime. It’s easy to do a spring clean of your wardrobe and donate your clothes to the Salvos but I hate throwing out food and you can’t give away half empty packets and jars. I am working on minimalising my pantry and thinking about what I can use up when I plan my meals but there will always be items that will remain a staple and I know I will use on a regular basis. What do you always have in your pantry that you regularly use? 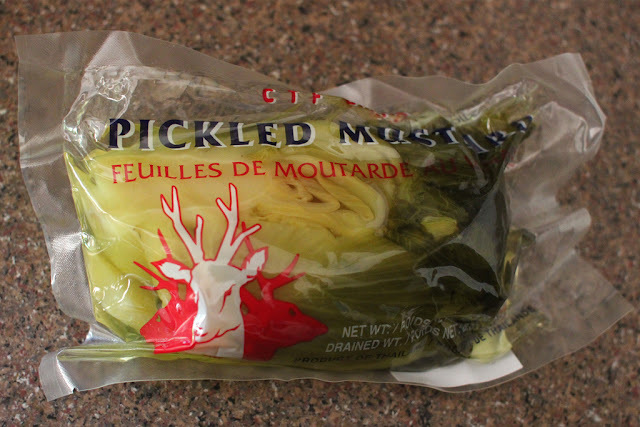 One of my pantry staples is pickled mustard greens. It’s cabbage like with a distinct horseradish-mustard flavour. Good for stir fries and in soups. While pickling food was invented as a means of survival to preserve foods through the seasons, and even though it results in food with a pungent, salty or sour taste which can be an acquired taste, it’s becoming widely enjoyed. All sorts of pickles are appearing more and more on restaurant menus as appetizers, sides and condiments, adding another dimension of flavour to dishes. Pickles are the new “it” food. Check out the video on Youtube We Can Pickle That or pickle your website http://www.wecanpicklethat.com/. People may make a fuss over pickled foods these days but I’ve grown up on them. It’s a key component of many Asian cuisines – Korean food would be nothing without kimchi, a Vietnamese banh mi would not be complete without pickled carrot, the pickled vegetables that accompany Japanese meal sets are mandatory and I love the mixed vegetable and fruit pickles you get as sides with Indian meals that you can mix into the rice along with the curries or slap onto some naan bread. Pickles are essentially a cheap pantry staple, an easy way to feed a family on a budget. My mum always has a stash of pickled vegetables in the pantry to add as a side to complement meals or use in cooking a dish. 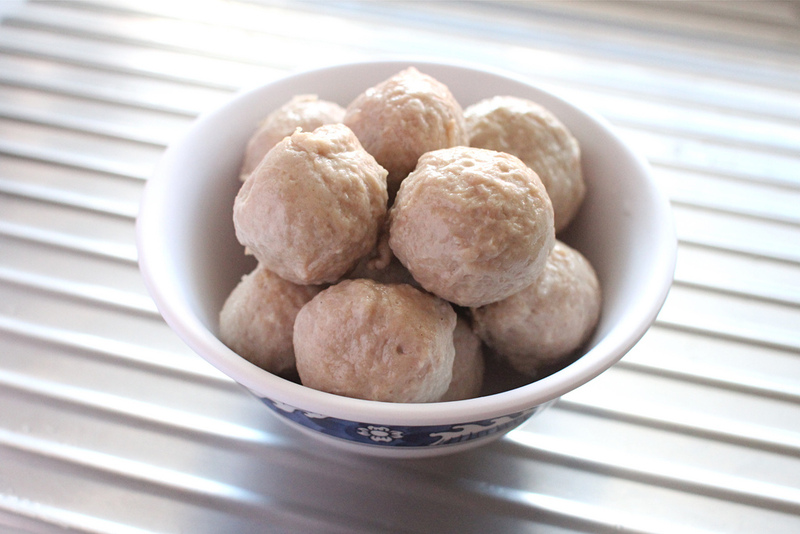 It adds another layer of flavour and texture to a dish, and the acidicness enlivens the palate. A bowl of plain congee with some pickled vegetables on top is a simple treat in the morning. This is one of those economical simple home cooked dishes that my mum cooked frequently for the family. 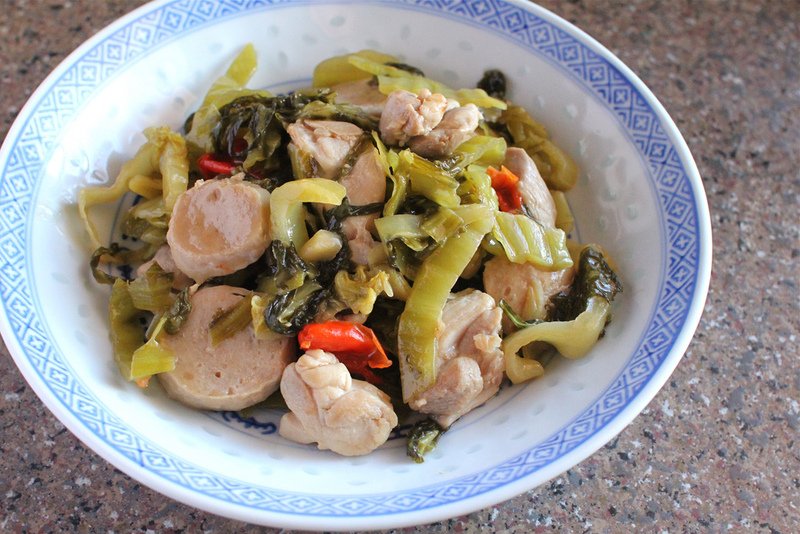 The dish is prepared by stir frying pickled mustard greens with chicken and sliced pork balls. Serves 4-5 with steamed rice. Notes: Quantities below are approximate. My mum would always add a bit more meat to feed a family but you can add smaller quantities of meat. Taste as you go while seasoning with the fish sauce, oyster sauce, sugar, salt and pepper until you get desired balance of flavour. Prepare pickled mustard greens. 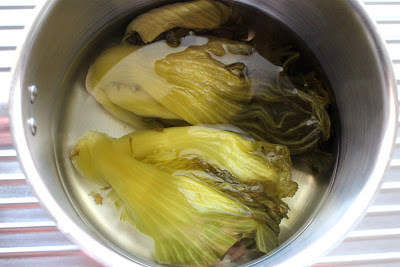 Soak the pickled mustard greens for 6-8 hours or overnight in a pot of cold water (this reduces some of the saltiness/sourness). Remove and drain. Then slice the mustard greens. 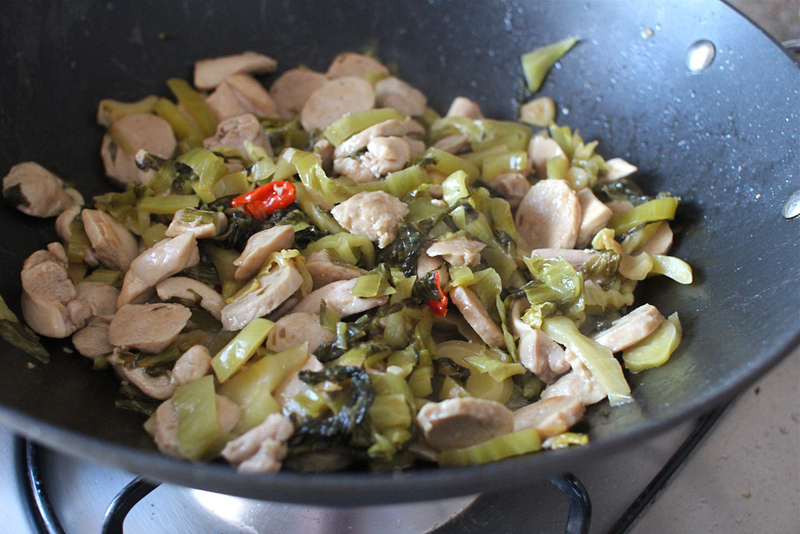 Heat a little oil in a wok and stir fry the garlic and chillies until aromatic. Add in the chicken pieces and fry until nearly cooked. Then add in the sliced pork balls and fry for a bit. Add in the sliced mustard greens and season with fish sauce, oyster sauce, sugar, salt and white pepper to taste. Then add in some stock, bring to boil and thicken the sauce with cornflour mixed with water. I recently cleaned up my pantry and found 16 cans of various tomatoes. Oh my word. I don't even like canned tomatoes but I keep buying them! What is wrong with me? 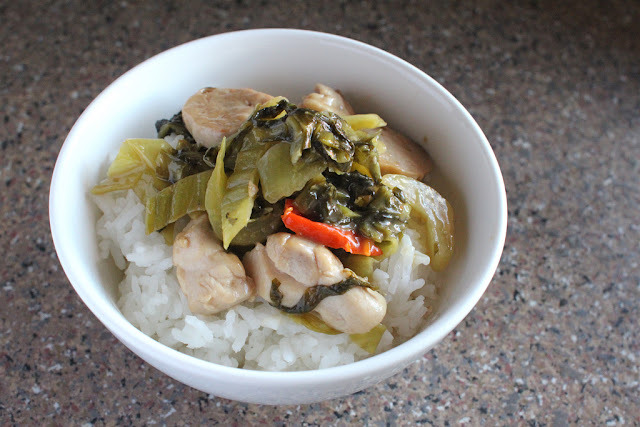 I don't think I have ever tasted pickled mustard greens but that dish looks so good. I will be using my hibernation time in winter to eat through my pantry! haha I'm with you on the pantry situation. I swear I've got duplicates of everything especially the herbs I only use once a year! Love pickled veg!